Avocados are one of the few fruits that contain fat and it is considered as one of the healthiest fruits with more than 25 essential nutrients, including vitamin A, B, C, E, K, copper, iron, magnesium, potassium and etc. This green fruit is rich in potassium which are known to help blood pressure control and fibre for digestive health. Furthermore avocado also provides more magnesium than twenty other fruits such as banana, kiwi and strawberry. - Press a ripe avocado with your finger, it should leave a little ‘dent’. If there is no dent, then the avocado is not ready to eat. But if it dents very easily then it might be over ripe and probably best to avoid. - Firm avocado will take about three to five days to ripen if left at room temperature. Store unripe avocado with banana in a paper bag to accelerate the ripening process. With it rich and creamy flavour, avocado makes a delicious addition to variety of dishes and it is often paired with chicken. Beside that avocado can be one of the ingredients for salad and it goes well with lemony or garlicky dressing. If you are looking for a meat combo, recipe for our popular reader's choice (with more than 430K+ Pins) Avocado Chicken Parmigiana can be found here. Fries are one of the popular finger food that we could hardly resists especially those that comes together as a side with fast food like burger or fried chicken. And if you read up my first post on Airfryer Recipes there is a quick fix healthy sweet potato fries which goes well with any weekday night roast that you might be interested to take a look. Here to create another healthy snack with Airfryer, I replicated an oven baked Avocado Fries recipe and to my surprise the total baking time actually reduce from 20 minutes (oven baked) to 6 minutes using air-fried function. The end result is amazing with crispy outer crust that taste similar to deep-fried plus the avocado slices still remains moist and firm too. Bonus point is due to the quick cooking time, it does not affect the taste of the avocado which still remains neutral rather than bitter. Recipe adapted from Kim's Healthy Eat; Oven Baked Crispy Avocado Fries. 1. Preheat Philips Airfryer to 200°C (Degree Celsius). 2. In a 3 compartment container, put in flour mixture (mix flour with salt, pepper and cayenne pepper), beaten egg and panko bread crumb as shown in the step-by-step photo above. 3. Lightly coat slices of avocado in flour mixture; next dip them in beaten egg then roll them evenly with panko bread crumbs. 4. Place prepared avocado into the basket and slide it into the preheated Airfryer. Set the timer for 6 minutes and fry the avocado fries until the timer beeps and fries are crispy and golden brown in colour. 5. Remove avocado fries from the basket, serve with squeeze of fresh lemon juice or some Greek yogurt with honey. A short cooking video on preparing the Air-fried Avocado Fries. No trace of oil found. This was such as guilt free healthy snack which requires no oil (you check out from the photo above where only the crumbs are being collected at the bottom of the pan) in the whole cooking process and yet the outer crumbed texture was so crispy. And also don't be alarmed when you saw crumbs flying out from the air-outlet as this was part of the air-fried functions. 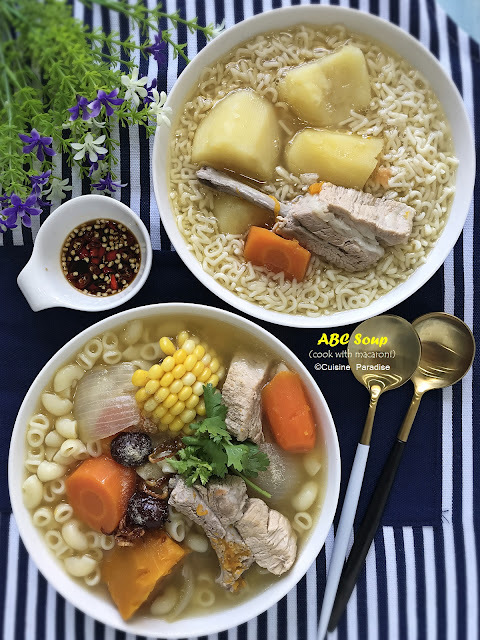 Why paying S$3.00 - S$5.00 for a cup of Avocado Milkshake/Smoothie when you can easily prepare them at home with just a few ingredients and a twist the flavour of your choice. Often for a quick lunch I would just blend one avocado with 500ml cold fresh milk and sweeten it with 1/2 tablespoon of honey. But you are always welcome to add in more ingredients such as 1/2 ripe banana, yogurt and chia seeds to thicken the mixture into smoothie too. *by adding Greek yogurt and crashed ice it will taste more like smoothie which is thick and creamy. 1. Place avocado, honey, milk, chia seeds and "yogurt plus ice cubes" (if using) into the hand blender container, blend on low speed till smooth and creamy. 2. Pour mixture into serving glass and served immediately. 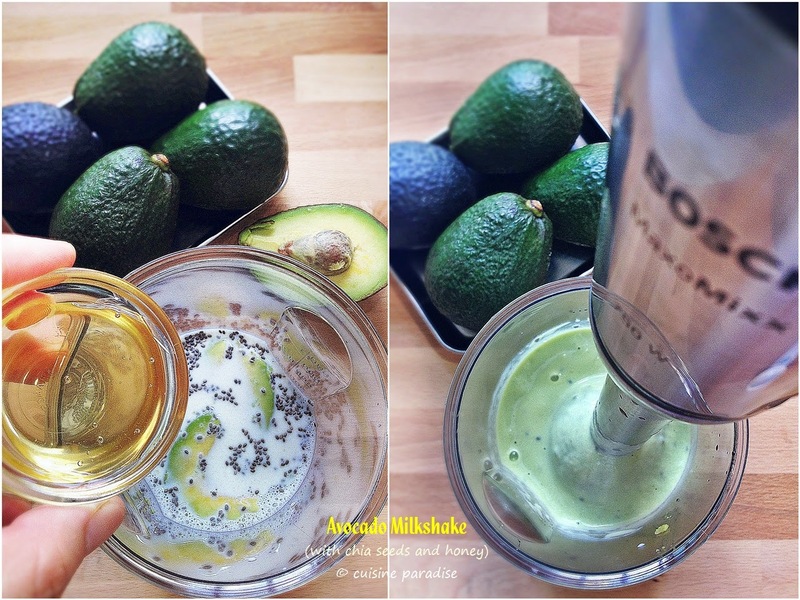 A short clip on how to prepare the Avocado Milkshake using a hand blender. ~ For an Asian flavour, you can sweeten your avocado milkshake with gula melaka syrup or drizzle of melt chocolate instead of honey. 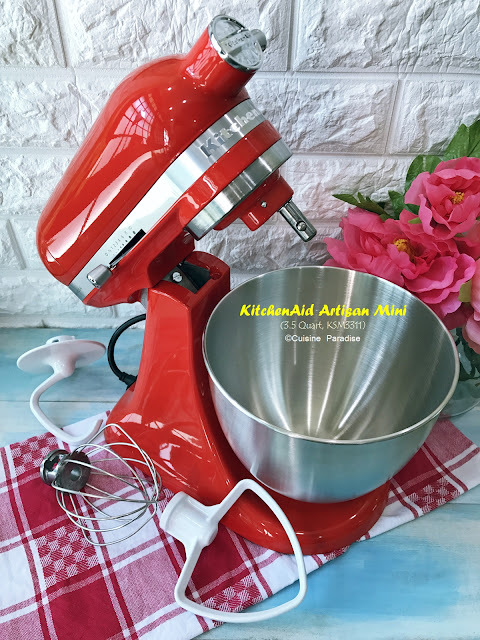 ~ A hand held blender (I am currently using Bosch MaxoMixx MSM87180 Hand Blender) will be handy when for making this beverage when compared to a juicer or blender. 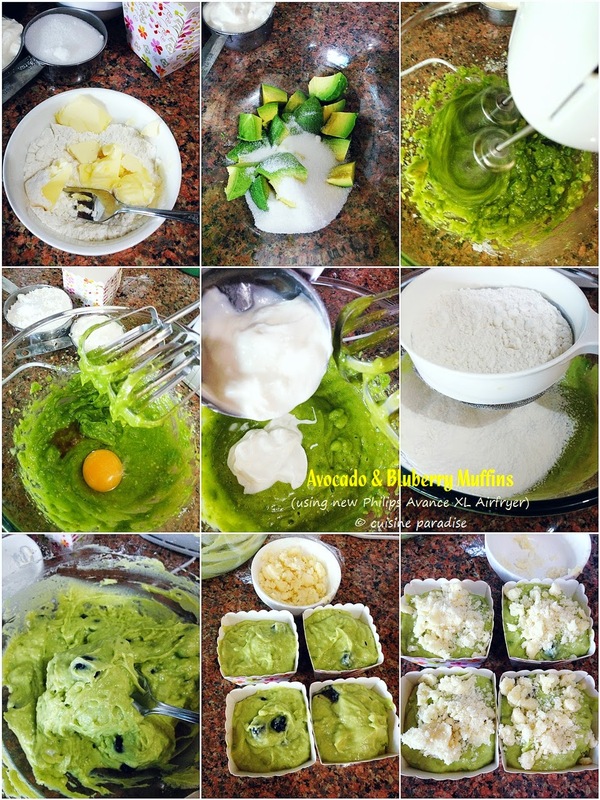 I am always curious about using Avocado in making sweet desserts such as cheesecake, muffin, Panna cotta, and etc. I remember when I was staying in Australia years back, I had an avocado dessert which made by one of our neighbour and it taste rather similar like mango pomelo sago. Perhaps I should try to replicate it one of these days. Here in order to test out another cake recipe using the Airfryer I decided to make some muffins which requires minimum baking utensils and skill. So with the ripe avocado that I have, I baked some Avocado And Blueberry Muffins. 1. Preheat the Philips Avance XL Airfryer to 180°C (Degree Celsius). 2. For the streusel topping: Using a fork to incorporate the butter with flour and sugar into fine crumbs. Set aside in the freezer while working with the batter. 3. In a medium mixing bowl add in avocado and sugar (roughly mashed the avocado using a fork) then beat well blended. Crack in egg and continue to beat until combined. 4. Next add in vanilla extract and yogurt then continue to beat till combined. Stir in sieved flour mixture (flour, baking powder, baking soda and salt) in two batches until well mixed before folding in the blueberries. 5. Spoon batter into muffin cups,sprinkle with streusel topping then pop them into the Airfryer basket and bake in preheated temperature for 10 minutes. 6. When the timer beeps, lower the temperature to 165°C (Degree Celsius) and continue to bake for another 10 - 12 minutes or until top crust is golden in colour and a skewer inserted in the centre and comes out clean. 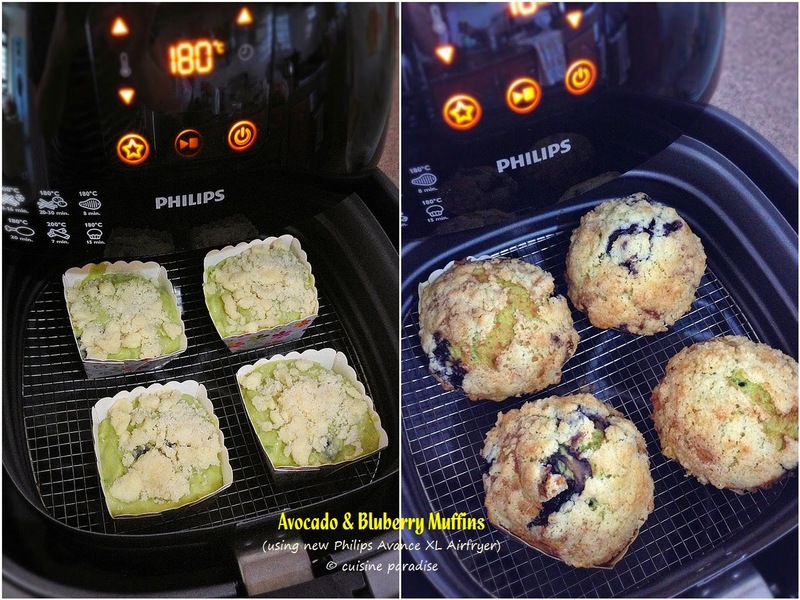 A short video clip on preparing Avocado Blueberry Muffins using Philips Airfryer. Instead of baking these muffins in the normal conventional oven, I test bake it using an Airfryer and the end result was satisfying. Indeed this moist and fluffy muffin taste great with a crispy streusel crust plus light scent of avocado taste. And the most important fact is, this recipe does not required any Oil/Butter too. Since avocado is in season now, I am sure you can take this opportunity to try out this nutritious fruit on it's own or venture into some of the recipes mentioned above. 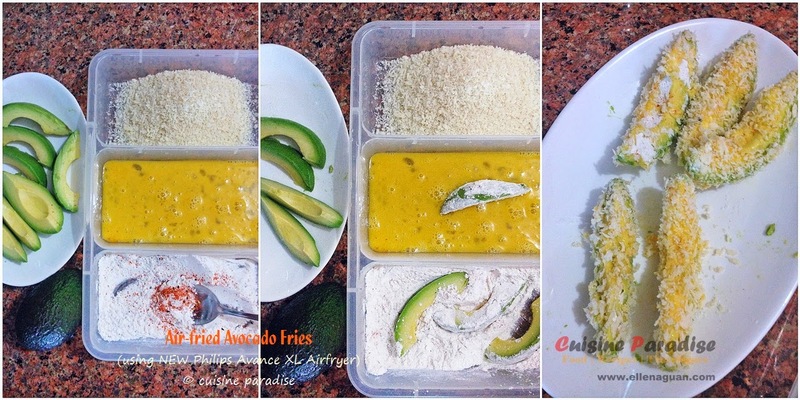 Lastly I hope you will find this post useful and do give the avocado fries a try if you are looking for some quick snacks to munch on. Till then do stay tune for Part II of the avocado recipes which I would share more new ideas including a sugar free ice-cream recipe too. 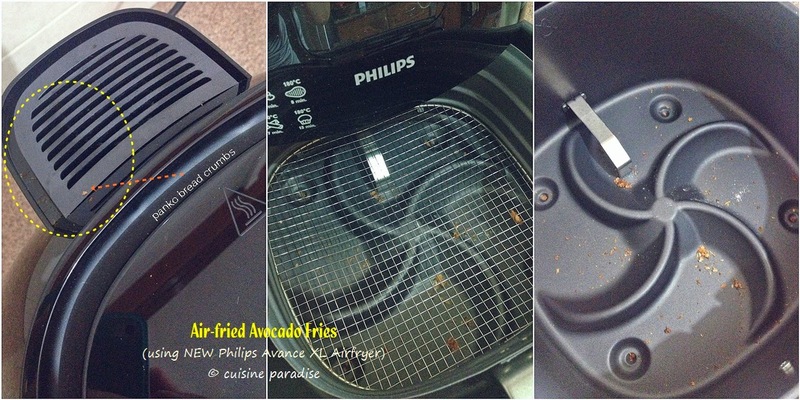 *Disclosure: I was given a set of the new Philips Avance XL Airfryer for this review purpose by the folks of Philips Singapore. All opinions expressed in this post are my own and there is no monetary compensation received. Ellen, avocados deep fried is the rage in states. I have an avocado tree in Hawaii the produce round size of cantaloupe. Deep fried avocado serve with aoli sauce is most popular. Seen in wedding app. Love the avocado blueberry muffin, especially the bright green colour! Will definitely try it out one day. how long should the avocado and blueberry muffins be baked in a regular oven? i would love to try out the recipe, but i don't have access to an airfryer.